BTS, a seven-man K-Pop hip hop group, has been a creative inspiration to me in ways that I didn’t believe would be possible for my cynical-of-mainstream heart and mind. 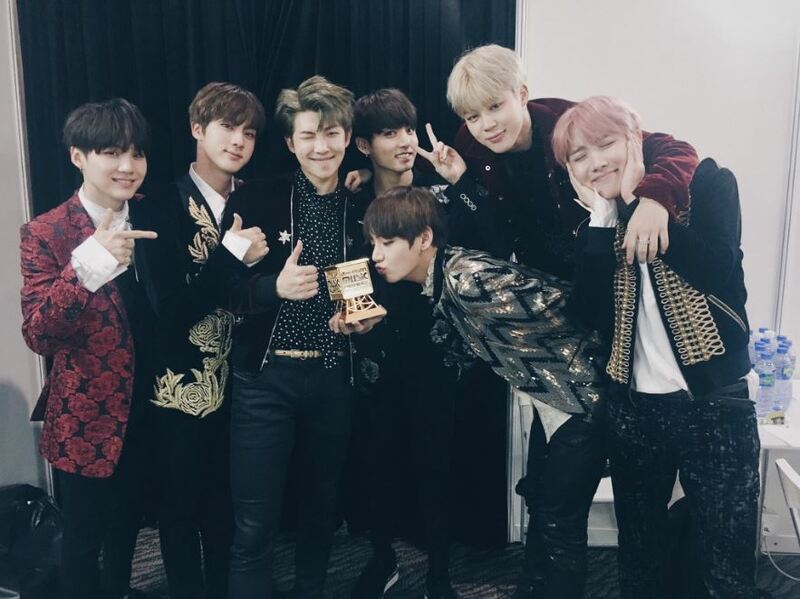 With their recent win of Mnet’s Asian Music Awards (MAMA)’s Artist of the Year Daesang, they have literally started from the bottom to win the most prestigious award for Korean musical acts. Thus I found myself writing about why this phenomenal group resonates with me and my creative development, and why I think it transcends borders for so may fans. BTS is the English name based on their Korean name, Bangtan Sonyeondan, which translates to “Bulletproof Boy Scouts”. It’s quite a high-flown title and reminded me of something like “Fullmetal Alchemist” at first. As they’ve explained in a few interviews, they chose this name because their music is meant to reflect the issues that teenagers and youth in their 20s in society, and use their songs as a shield against prejudice. And I’ve been delighted to find BTS’s name and motto remains true, in their musical production as well as their visual direction that engage with social consciousness themes for a youth age group. They have done this in an unpretentious way that allows young fans to have open conversations about difficult topics on family, mental health, inequality, sexuality, and more. As someone who has enjoyed Cinema Studies in university, some have called my cultural media interests esoteric and niche and out of touch with what’s “popular”, but BTS has shown that you can have it both ways; Their strength lies in their simultaneous presentation that is both accessible and self-reflexive, with both breadth and depth. Throughout the rest of this winding article, I will present what ingredients in their oeuvre makes them such a creative and commercial success, and key points that I believe any commercial artists of any medium who strive to talk about social consciousness in their work can learn from. Ned (to Ray): You’re missing something. Biological is what we are. I think most people would agree that being biological is the quintessential attribute of being human… and I plan to keep it that way. How can it be proven that future technological revolutions in genetics, nanotechnology and robotics can benefit the social totality and realize humankind’s teleology? Ray Kurzweil contends that future technology shall inevitably prevail against even slow institutional change to extend the evolution of human intelligence beyond their biological capacity. Although there is no disputing that the augmentation of human intelligence is a worthwhile purpose, Kurzweil presupposes that technology will be able to innovate at a steady exponential rate because of the economic imperative of the capitalist system. I contend that Kurzweil’s privileging of the modern rational subject as the self-referential position that subsumes natural orientations have caused two problematic inclinations: First, that he has neglected to describe intelligence as informed by the intercommunication of bodily senses and rational thought, and secondly, his reliance on the unproven value of the capitalist system. My overarching political argument is that a phenomenological approach to technical devices would enable more progressive and humanistic technology to flourish in differentiated cultures with more ease because of its consideration for the ambiguity of human subjectivities and positions. One of the unique attributes of a human being is his mimetic faculty that influences his peers and his surroundings to a higher degree of consciousness than any other species. This supposes that he is also a “porous being” in Heidegger’s terms, where his perception is the moment of decision that differentiates and mentally designates the ambiguous sensate inhabitants of his surroundings. Similarly, the output from informational technologies stimulates his rational capacity and simultaneously “the material layers of the human being: his nerves, his senses, his entire physiological substance”. Our reactions to the products of new media, travel, medicine, military, and so on cannot be understood as based on technical knowledge, but also as a carnal response at the point of perception. What I am referring to is what Shaviro calls “the primordial forms of raw sensation: affect, excitation, stimulation, and repression, pleasure and pain, shock and habit.” It is a kinetic relationship between the subjective intelligence that comprises of the reciprocal interaction of rational thought and sensate reflexes and takes in the tactility of the world outside of the body. That Kurzweil neglects this aspect of intelligence would weaken his value-based justifications that his technological vision truly augments the collective human potential. Indeed, there is no other blueprint for augmenting human intelligence than on researching into the continuum of our own species, and it would be a fundamental error in scientific practice to see the mind as disconnected from the body. However, this is exactly the historical basis by which we understand the place of the technical within the human society. Peter Woelert contends that, since the work of Descartes, the modern technical dominant is characterized by a gap “between a disembodied, rational subject on the one hand and a rationalized, objective material world on the other”. As nature becomes mechanistically rationalized, human body follows suit because it is derived from natural causes. The modern technical subject thus has ascended all previous notions of natural orientation and becoming, and it has become self-referential and an end in itself. The exponentially increasing vitalization of technologies since World War II has assimilated the conceptual position of both nature and the subject into its Symbolic auto-functions. In other words, the bodily subject is no longer thought of as free from technology and able to reflect itself autonomously. Woelert implies that modernity has been a consistent cultural dominant that has deprecated the evolution of the subject, even so far as to say that technology has totalized the capacity for man to know himself as only through the production of his technical apparatuses. Under such formulations, there is nothing ‘post-’ humanity about Kurzweil’s political project, because it is part of a trajectory of technical rationalization that repudiates the function of nature and subject, and humanity the subject is foreshortened of its depth. According to Marcuse, technology is always a historical-social project of specific coded values, and that its apparent neutrality is ideological. Technology is not something that enables a direct perception of the world, but that it re-conceptualizes how we see the world. Vivian Sobchack sees that expressive technologies are also historically constituted in altering previous forms of temporal and spatial consciousness and the bodily sense of subjective existentialism. With technology of the everyday manifesting an “objective” Symbolic familiarity into the body, technology compels a loss of its own history. Pushing for the attraction of the new, the old is denied of its immediate precursor to the current. In other words, the multiple technical transformations of the body privilege certain perceptual dispositions while concealing other possibilities. There is without a doubt a sense of excitement and play involved with current technologies, and the spectacular with the prospect of the promises of future technologies. The implications of having carnal interest with the dominant disembodied technical rationality is that a subject is simultaneously invested in both being “inside” the body and “outside” mapped onto the object of tactile desire. As such, “there remains no basis for preserving the mutual exclusivity of the categories subject and object, inner and outer, I and world.” Thus in the labour of the body, there is an ambiguity and inconclusiveness to the routine authorship that the capitalist system is predicated on. The senses and each part of the body autonomously have its own memories that are pre-reflective, perceived from a non-authored, uncategorized world, as it engages with work that is artistic, philosophical, and scientific. Kurzweil claims that the free market functions as an equivalent to natural evolutionary competition, but this statement only reveals his mechanistic bias that overtakes the orientation of nature as I have stated above. It is not a claim that is true by necessity. Moreover, it is problematic to see economic emancipation as the fundamental basis for social freedom that is the unarticulated basis for the worldwide dissemination of such technologies. Race and gender theory has shown that social oppression can only be alleviated by equality rather than economic emancipation. This is a project better taken up by phenomenological considerations that influence the technical because of the natural equality between humans on the basis of their senses and their intelligence unconditioned by social opportunity. The sensorium is necessarily acculturated and situated in history to enable sites of difference, a prerequisite for alternative narratives for the cultural being. Furthermore, Kurzweil’s concept of transcendence is problematic because it does not offer an alternative to calculative thinking, nor does it offer the space for resistance, such as with the pre-reflective cultivation of practices that are not produced under the dominant mode of efficiency. Correspondingly, Kurzweil misunderstands the function of art, which generates dialogue through affective means, rather than necessarily demanding a rational response. Altogether, Kurzweil has reduced human teleology to its objective rationalism, scraping the means of play and curiosity and the imperfection of metaphoric language that is wholly engaged with the sensate body. I have maintained in the interest of the human sensorium in the consideration of prospective bio-revolutionary technologies because of its teleological interests to the human subject. As such, threats to sensate experiences should be factored in as part of the fine-grained relinquishment of potentially dangerous innovations. I have also contended the age-old expression that “money can’t buy everything” by privileging the complexity of the sensate body. This is because the capitalist mode of reproduction together with technical rationalism has on the whole forsaken critical exploration for marginal and “inefficient” sensate narratives. Our capacity to have meaningful experiences is not divorced from our carnal accesses through technical perception, where we “proprioceptively feel our weight, dimension, gravity and movement in the world.” As technology is an ethically and politically coded phenomenon, there are many possibilities to its realization for the value of mankind that have yet to be fully determined. Barry, James Jr. “The Technical Body: Incorporating Technology and Flesh.” Philosophy Today 35.4 (1991 Winter): 390-401. Belu, Dana S. “Thinking Technology, Thinking Nature.” Inquiry 48.6 (Dec 2005): 572-591. Kurzweil, Ray. The Singularity is Near: When Humans Transcend Biology. New York: Penguin Books, 2005. Sobchack, Vivian. Carnal Thoughts: Embodiment and Moving Image Culture. Berkeley: University of California Press, 2004. Woelert, Peter. ““Man” and His Technological Doubles.” Philosophy Today 52.2 (Summer 2008): 157-164. Kracauer, as qtd. in Sobchack 55. Shaviro, as qtd. in Sobchack 59. Merleau-Ponty’s elaboration on the intercommunication of the senses, in Sobchack 71. In the sense of Tom Gunning’s notion of attractions, understood in this sense for consumer culture. Iris Marion Young, as qtd. in Sobchack 66. I am evoking the state of nature as understood through Hobbesian terms, where each man is equal in their bodily dispositions (includes the brain) that they each have the equal opportunity to each other’s mortality.